Tubeway (Sales) Ltd are manufacturers, stockists and distributors of Magnetglaze and Magnetglaze Extreme, which are cost effective detachable Magnetic Glazing systems that can be easily installed with a few simple tools. This product is quite simple: adhesive steel tape is stuck to the window surround; magnetic tape sticks to the rear of the plastic glazing sheet, and the two clip together and remove instantly and easily time after time. Tubeway offer a number of specifically designed cosmetic and practical add-ons to both versions of this system, all of which are described below. We only recommend using plastic sheet (Polycarbonate or Acrylic) with Magnetglaze and the Extreme systems (do NOT use glass). 2mm thick plastic glazing sheet is often suitable for small windows, but 3mm or 4mm can be used for medium and larger windows if required, particularly to add rigidity. As a failsafe, to remove any question of slippage of the magnets on the steel tape, you can place a couple of pins immediately below the bottom steel strip where they will not be seen. However, where the window is particularly large, heavy or draughty, the significant extra grip of MG Extreme will address any issues about magnetic grip, and allow thicker sheet to be used if desired. Always fit magnetic panels to the internal window frame and never to an opening window light. Like all of our Easyfix Secondary Glazing systems, Magnetglaze and MG Extreme can cut fuel costs by reducing heat loss and eliminating draughts, as well as insulating against noise. 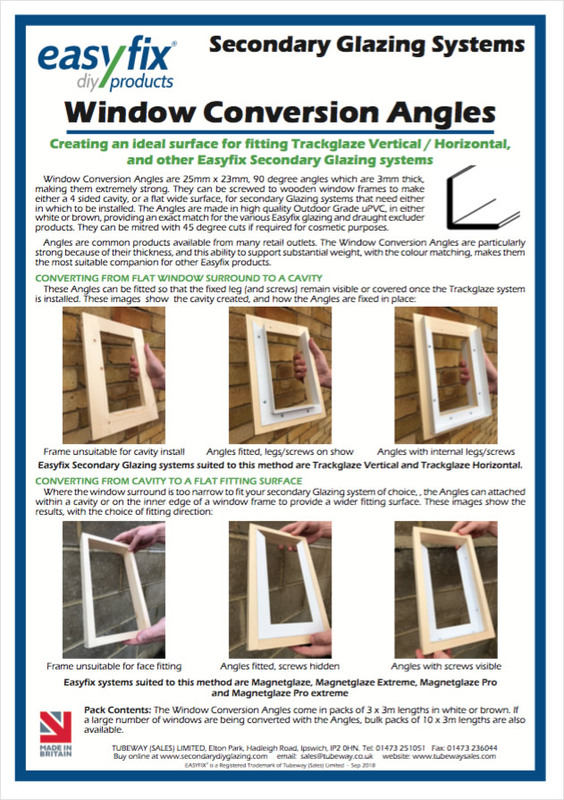 Click through for details of all the DIY Glazing systems we offer. Although the appearance of Magnetglaze is quite unobtrusive, it is possible to smarten it and hide any slight defects on the cut edge of the glazing sheet, by adding Magnetglaze Finishing Trim. This 20mm or 32mm wide self-adhesive brown or white flat strip has rounded edges and can easily be mitred for excellent cosmetic results, as shown in the photographs to the right. The 20mm size is designed for standard Magnetglaze, whilst the 32mm Trim can be used to cover the Magnetglaze Extreme strips - both sizes are self adhesive and can be purchased in 5m coils. They are easy to mitre neatly to 45 degrees as they are thin enough to be cut with a strong pair of scissors. 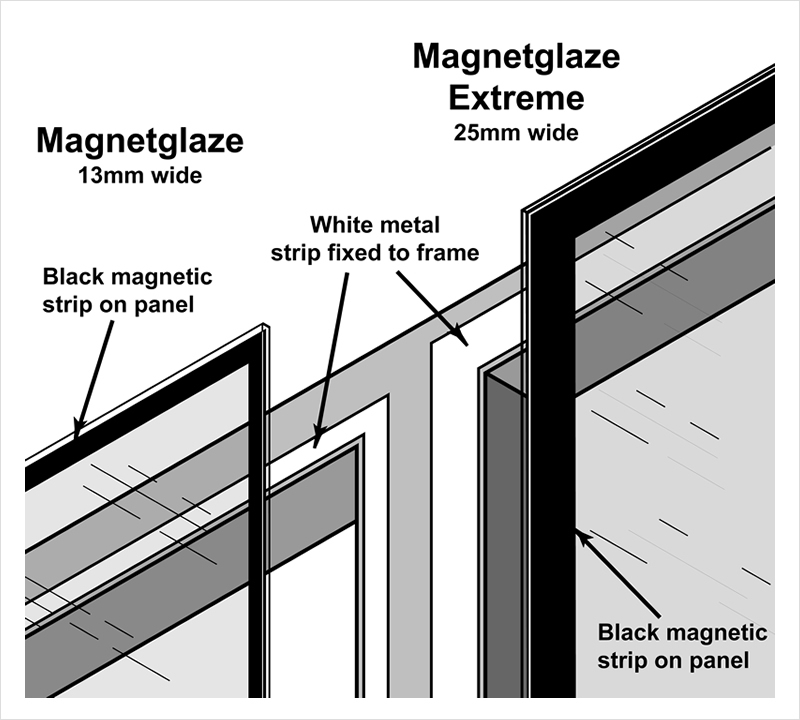 As an alternative to the Finishing Trim, Tubeway also offer Magnetglaze Pro and MG Pro Extreme, which uses the same magnets and steel, but the magnetic strip is already attached to rigid PVC capping, enabling framing of the glazing sheet after cutting 45 degree corners mitres using the special Mitre Bead provided. 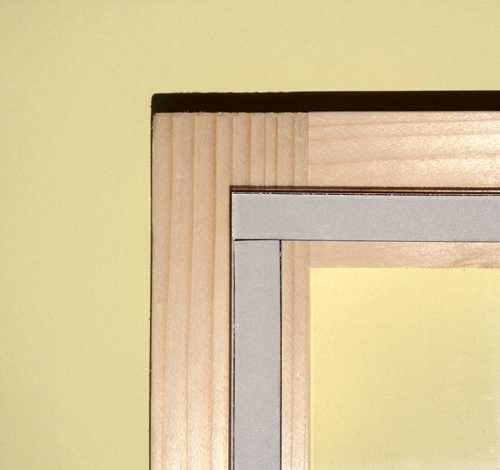 Sometimes it is convenient to be able to divide a tall magnetic pane into two parts, using a horizontal joint. Because it is most commonly applied to sash windows, the add on Sash kits can be used for this exact purpose. For the standard Magnetglaze system and 2mm sheets, the Magnetglaze Sash product uses a flexible joint to maintain the thermal seal but divide the secondary window pane. The Magnetglaze Sash Heavy Duty kit is designed for 4mm sheet, used as an add-on with either Magnetglaze or Magnetglaze Extreme systems. It uses a rigid bar to divide the secondary pane, making it more suitable for large and draughty windows. Details of both Magnetglaze Sash add-on Kits are here. For many households, Magnetglaze panels are used to insulate for most of the year, but come summertime, they may be removed for ventilation during the day and/or the night. At this point, it can be convenient to replace the panel with a magnetic Flyscreen, which clips directly onto the 13mm steel tape already on your window surround. Using a fine fibreglass mesh, magnetic strip and a white or brown lipped edging, Magnetglaze Flyscreen will prevent winged insects, spiders and other creepy crawlies from entering, but allow fresh air of course. 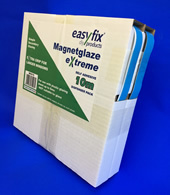 Magnetglaze Extreme, at 25mm wide, is supplied only in 10m cardboard dispensers, again, for ease of use during installation. To smarten the appearance of the finished secondary panes, Magnetglaze Finishing Trim 32mm version can be used, which can also cover the cut edge of the glazing sheet if needed. 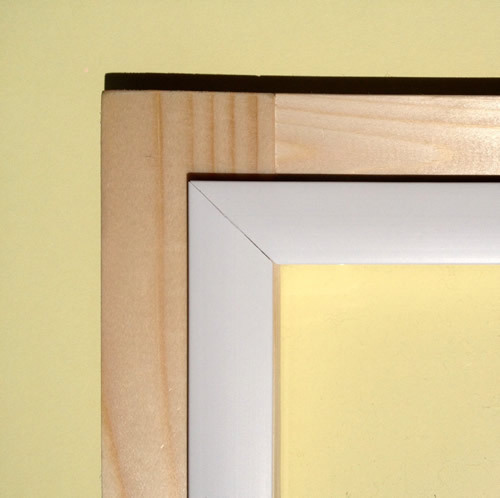 If your window surround has insufficient space to install Magnetglaze Extreme, you can fix Window Conversion Angles to the insides of the frames to give a clean wide surface on all sides. These Angles are heavy duty with a 25mm face, in white or brown. More information is in the PDF alongside, with pack details in the table below. PLEASE NOTE You can buy items from this site by phone subject to a £50 goods minimum order, plus Carriage and Vat. Alternatively, all Secondary Glazing and Draught Excluder products are available to buy online, in packs or singly, with cut-to-size sheet, from secondarydiyglazing.com.